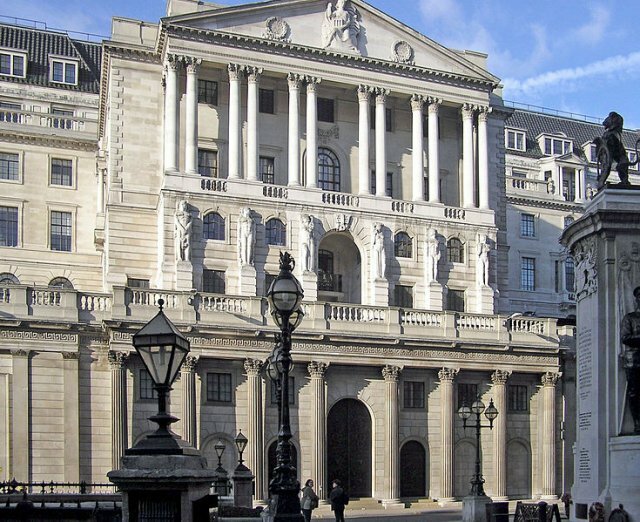 Sometimes known as the Old Lady of Threadneedle Street, it was founded in 1694, nationalised in 1946, and gained operational independence to set monetary policy in 1997. After the ’Glorious Revolution’ of 1688, there were calls for a national public bank to stabilise the nation’s resources. Many schemes were proposed but the successful one was from William Paterson. This envisaged a loan of �1,200,000 to the Government but in return the subscribers would be incorporated as the ’Governor and Company of the Bank of England’. The Royal Charter was sealed on 27 July 1694, and the Bank started its official role which it continues today. In 1734, the Bank acquired premises in Threadneedle Street. Over the next hundred years it added adjacent properties until the present island site was secured, and Sir John Soane’s massive curtain wall was erected round it. The Bank’s notes became an accepted currency - people seldom doubted that the promise to pay (which referred to gold coin of the realm) would be honoured. During the 1920s and 1930s, the Bank underwent a large rebuilding project. The Sir John Soane’s buildings within the curtain wall were replaced by a single structure designed by Sir Herbert Baker.